Add all purpose flour and salt to a large bowl,mix well.Add oil and incorporate it well into the flour. Add sugar and Rapid Rise Yeast and mix. Add yogurt and warm water (slowly) to form a soft dough.Knead for 4-5 minutes until smooth and elastic. Drizzle a few drop of oil to coat the dough,cover with a damp paper or cloth towel and let it rest in a warm place for 1 hour. Knead dough once again and divide into 4-5 equal portions.Lightly coat rolling surface with flour and roll out doing into a approx 5-6 inch round (note: dough tends to stretch back so make round bigger then needed). Carefully slide bhatura into the hot oil and gently keep pressing down with a slotted spoon until it puffs up. Flip bhatura to other side and gently press into the oil.Cook for 30 secs to 1 minutes,until golden brown,and remove onto a paper towel lined plate.Continue with remaining bhature. Serve hot with Chole or Chana Masala. Add together all purpose flour,baking soda and salt into a large bowl.Add oil and incorporate well into flour.Add sugar,semolina,yogurt,warm water (slowly) and knead to form a soft dough.Knead for 4-5 minutes until soft and elastic. Drizzle a few drop of oil to coat the dough,cover with a damp paper or cloth towel and let it rest in a warm place for 3 to 4 hour. Knead dough once again and divide into 4-5 equal portions. carefully slide bhatura into the hot oil and gently keep pressing down with a slotted spoon until it puffs up.Flip bhatura to other side and gently press into the oil.Cook for 30 secs ,until golden brown,and remove onto a paper towel lined plate.Continue with remaining bhature. Serve hot with Chana Masala. Bhatura looks perfectly made.. Nice that you have given two different recipes with and without yeast.. It is one of my favorite in any restaurant, never tried at home so far though..
its my fav, good post with 2 versions and very neatly explained!!!! Batura looks very fluffy and perfectly made. Lovely and tasty looking bhatura. Looks so soft and tempting. 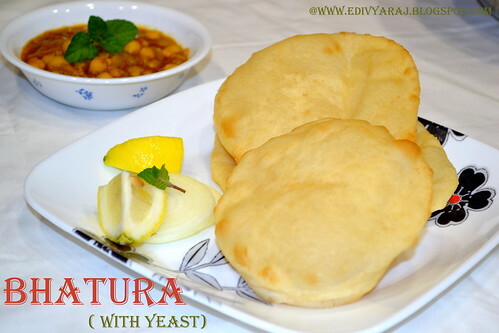 I love chana bhatura .. and I prefer the ones with yeast.. I feel they are a bit lighter. Thanks for sharing recipe with step by step images, these are veryhelpful. What an effort! Exactly documented the bhatura recipe. So perfectly made, bookmarked your two versions of this recipe. Love both ways, Taste yum with chole. Bhatura looks perfectly made...... Tasty too ! Happy to follow you will be happy if you follow me back dear! 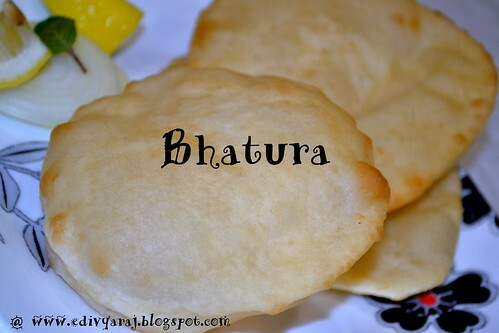 Perfect bhatura...loved both version...thank you for visiting my blog I honored..
Batura.. i have made it only once at home... nicely presented and well explained....which one was better??? Delicious fluffy batura looks yummy! 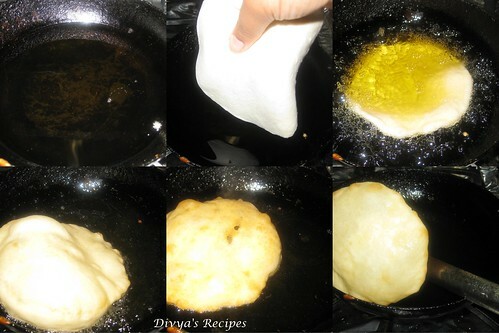 mmm.. i have always been searching for a perfect batura recipe.. this sounds like it.. I'm really intrigued by these tempting pictures. Looks fabulous! 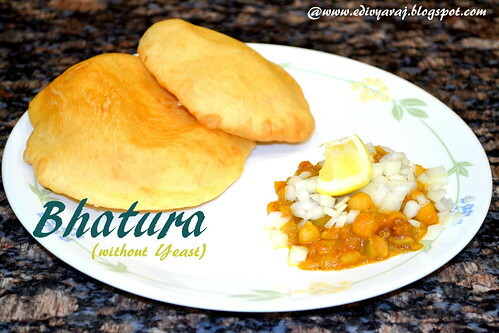 I have made it only without the yeast, yummy with the chole..
Homemade bhatura looks very nice and delicious dear. Superb clicks. Bhatura at home is really a treat dear. Looks superb. 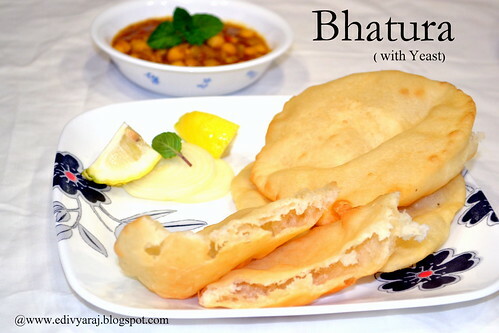 Ahh...I'm hungry seeing the Channa Battura :) Looks perfectly made! Nice and simple !!! This is something that most of us cant do without!! !